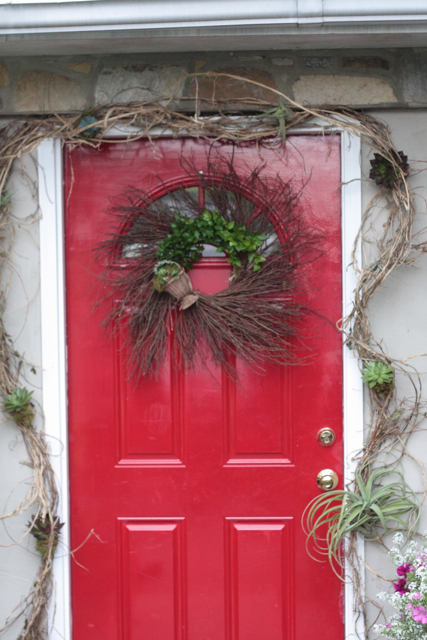 As promised I am going to show you how I decorated my front door. For now I am only going to give you a little teaser but I hope to finish the post later today. I am in the midst of designing for a photo shoot and I need a little more time in the studio this morning. So, when Evan and I were kids we bought a very modest home. Since then we have added onto the house many times, and it has become a wonderful full and beautiful home. However the front door is still, shall I say a little boring. 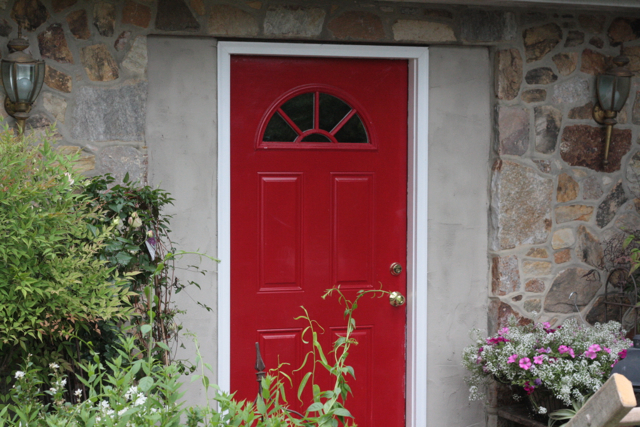 During the years it’s had various types of decor but recently Evan painted the door and put up stucco where the sidelights once were. 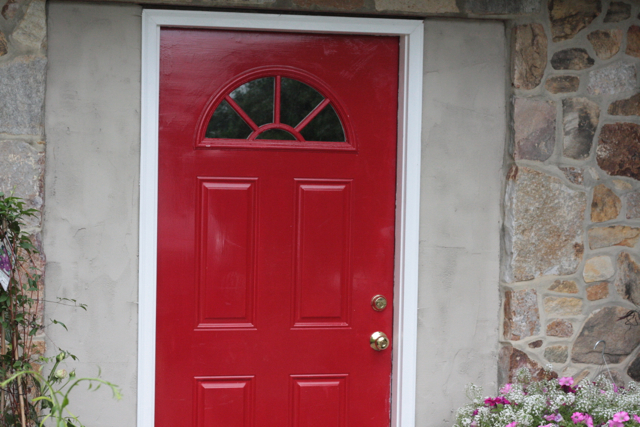 The front door has been sitting bare for a few months now and it was driving me crazy. First I started with a garland of honeysuckle vine. My challenge was to only use the existing nails. Evan is never thrilled when he sees me with a hammer in my hands. I don’t really have rights to the hammer in this house, let’s just say I have done some damage with that thing. I was sure if I started hammering and adding additional nails to the door frame I would crack his new stucco wall. Around the rim of the door are about 5 nails that Evan had begrudgingly left in the trim when he stuccoed the wall. This allowed me to hang a garland at Christmas. Back in the flower shop I had a box of succulents leftover from designing for the Virginia Gold Cup. The succulents did not have roots but thankfully they root very easily. 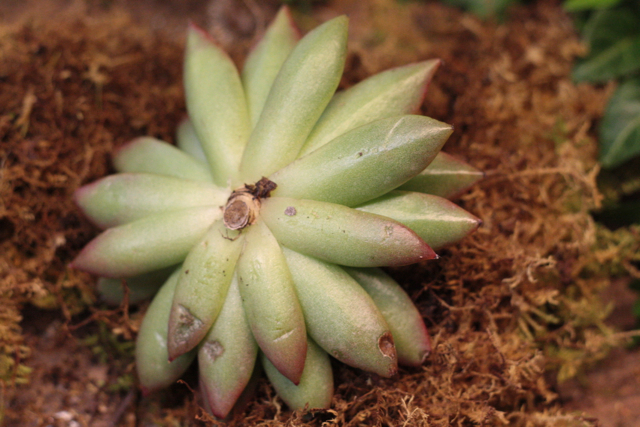 Succulents can be rooted in water or by laying them in soil. 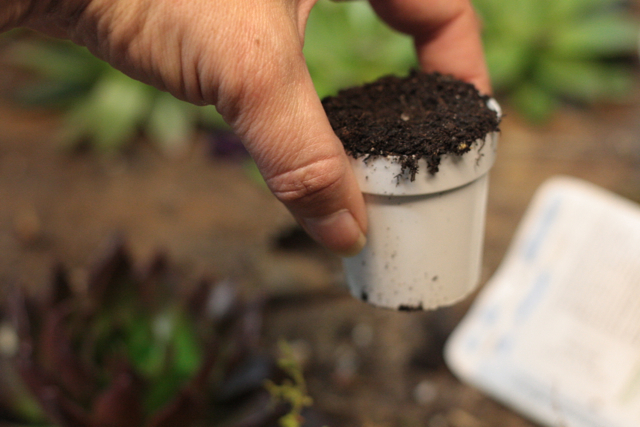 I happened to have super mini plastic pots in the studio so I filled them to the brim with potting soil. 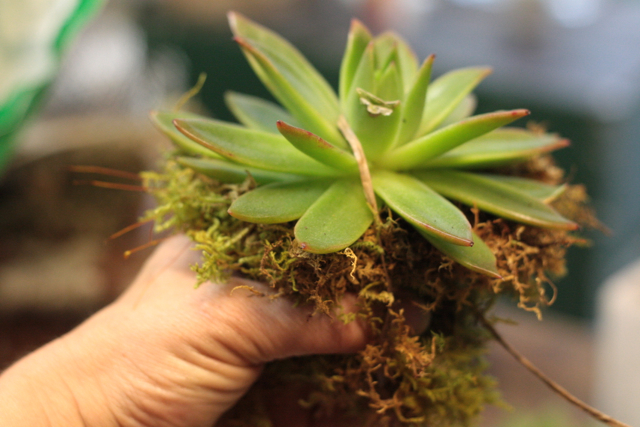 I laid the succulent on the soil and then gathered some fresh sheet moss from our stash. 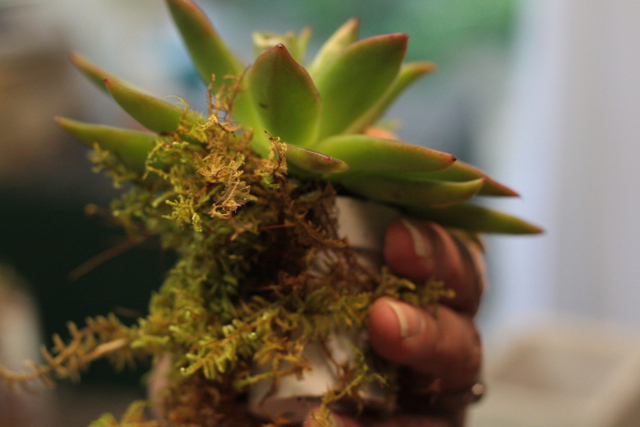 I used a floral product called bind wire to wrap the pot with moss and to hold the succulent in place. Bind wire is like a raffia wrapped wire and we use it for everything. 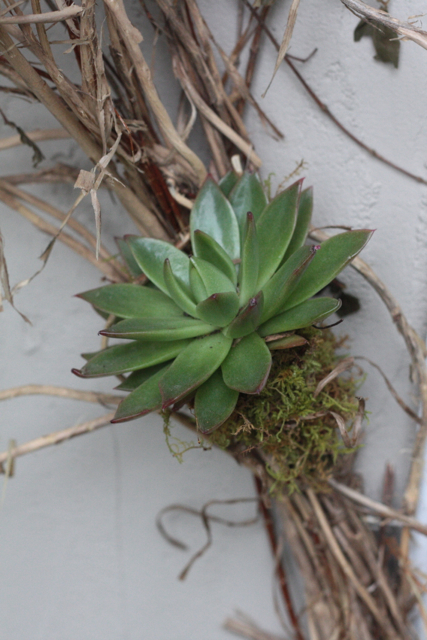 By wiring the succulent onto the pot this assured that the little succulent would stay attached to the soil long enough to grow a root. 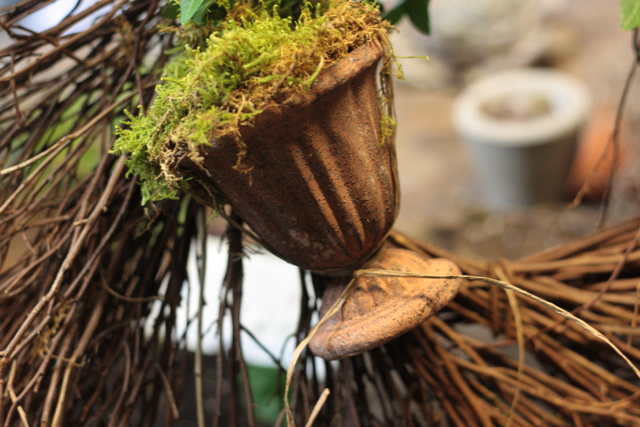 The little moss covered succulent pots were then tied into the garland. Next I took an old apple orchard ladder and leaned it against the house. 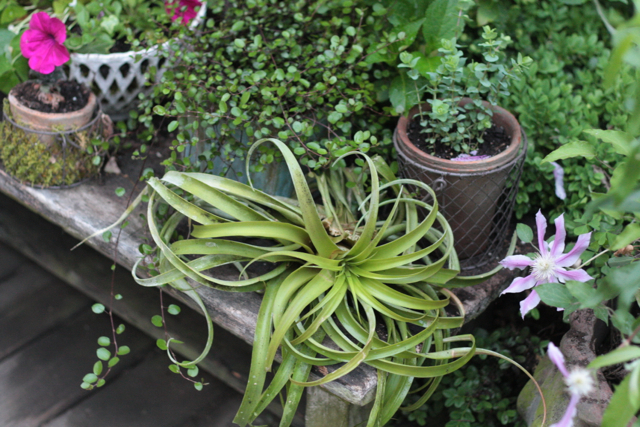 To decorate this area I rested a giant air fern or bromeliad on one of the rungs of the ladder. 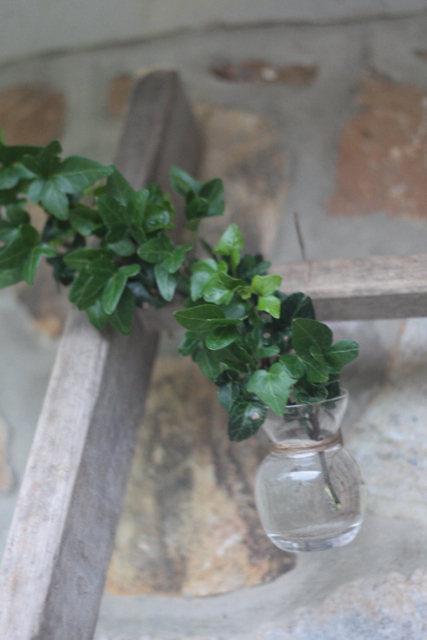 Small glass bottles of ivy were hung randomly on the rungs, this brought a different shade of green into the design. 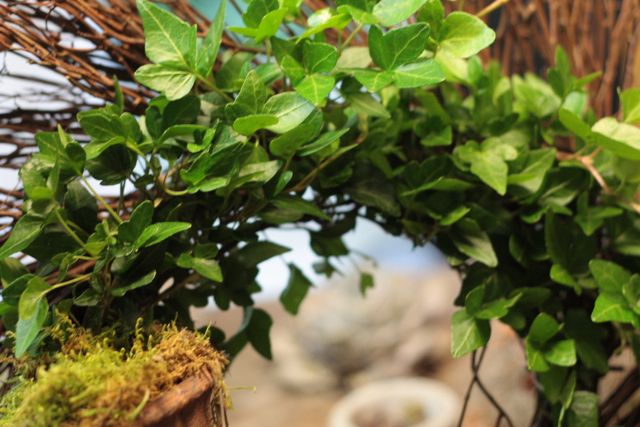 The ivy was gathered from my backyard and I know it will take root hanging right there in the vase. 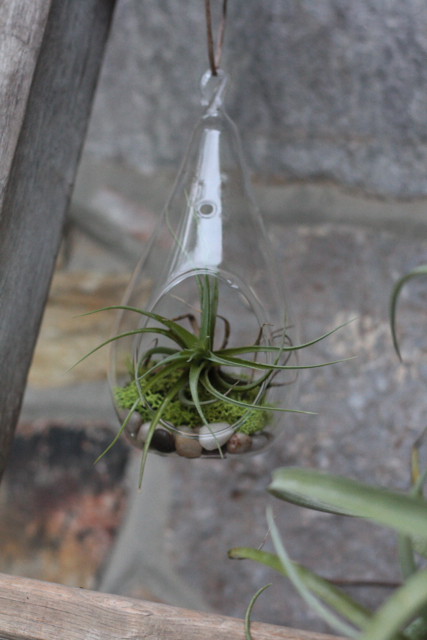 Little glass miniature terrariums were designed with river rocks, moss, and air ferns. 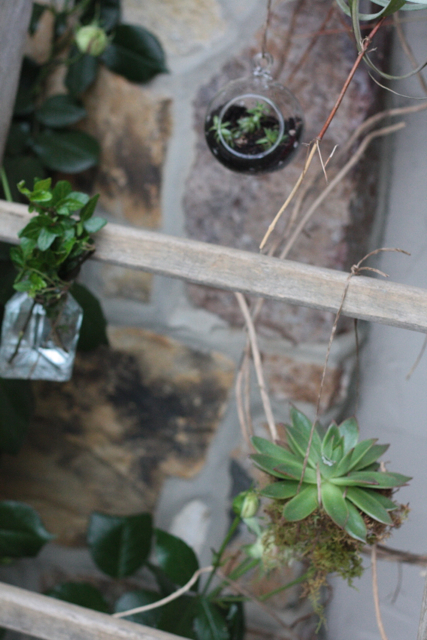 Some of the mini terrariums were even planted with hens and chicks. 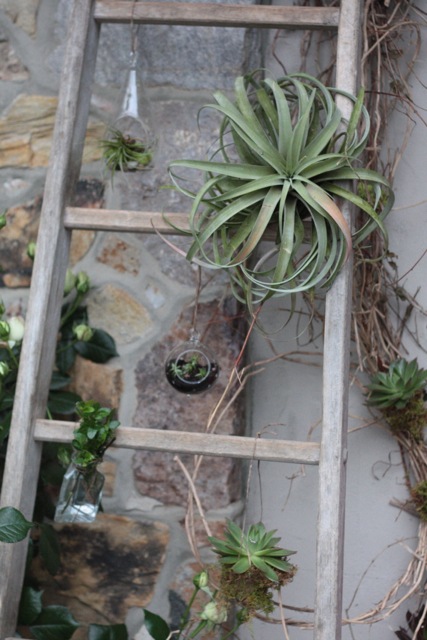 I also hung one of the moss potted succulents from the ladder. All were dangling with my magical bind wire. 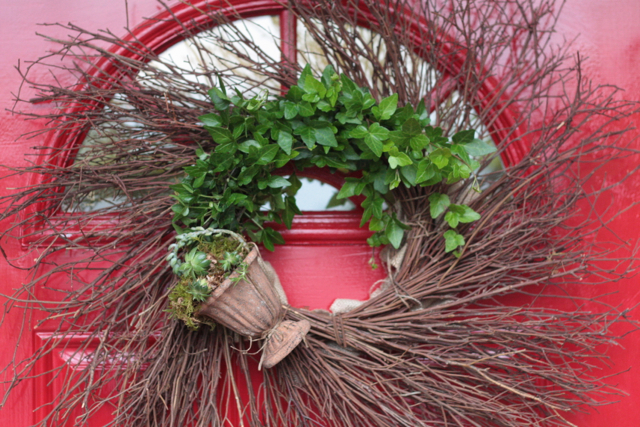 Next I created a wreath for the front door. 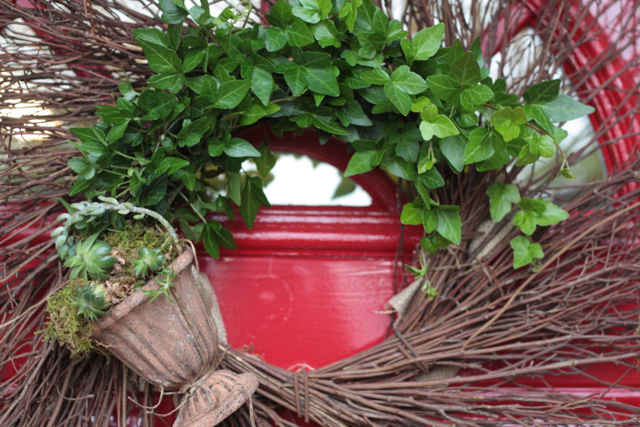 First I wired a small iron urn onto my wreath. The urn was full of soil and I placed another piece of the ivy directly into the soil. 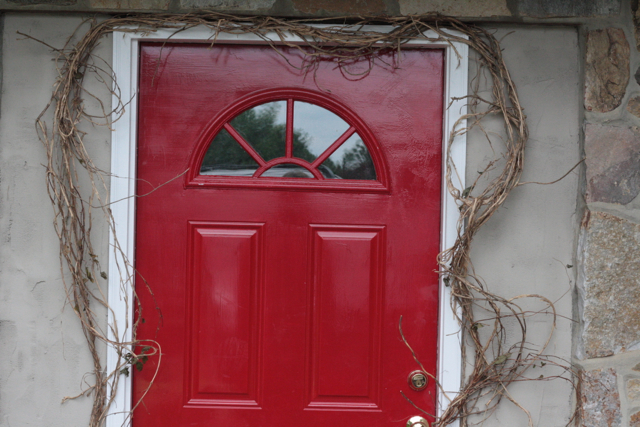 This time I chose pieces of ivy that had baby roots or runners on them. 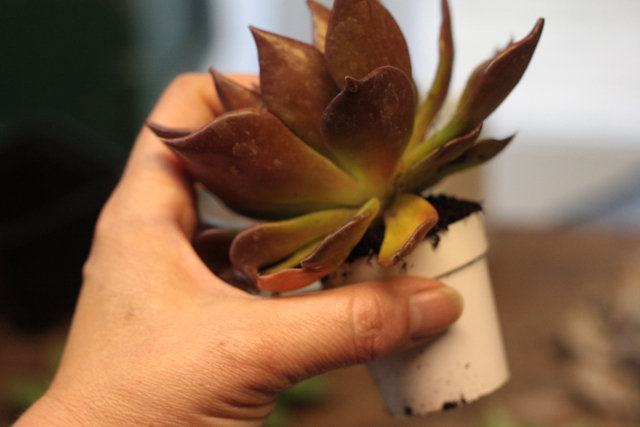 Miniature succulents were also placed in this pot. 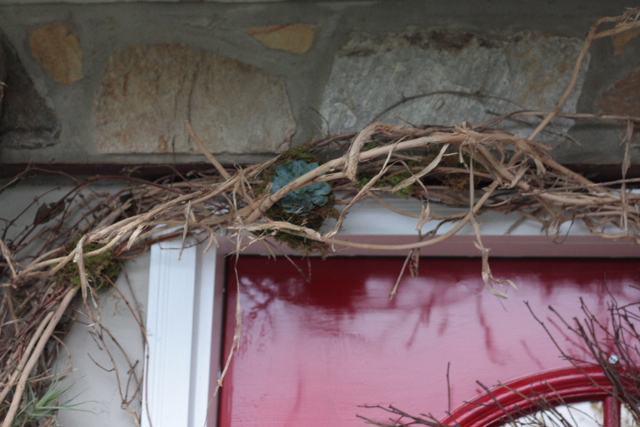 The ivy was then wired onto the wreath in a curved shape with… guess what, bind wire. 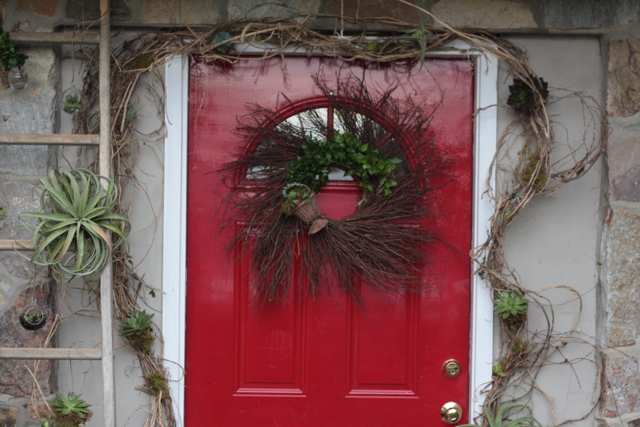 Burlap was added to the back of the wreath to protect Evans newly painted red door. 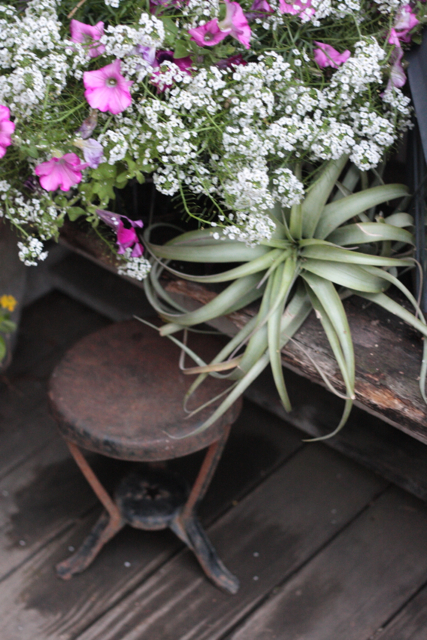 Hanging baskets, potted plants, vintage props from the shed, large air ferns, and more succulents were added to a bench that sits at the front door. 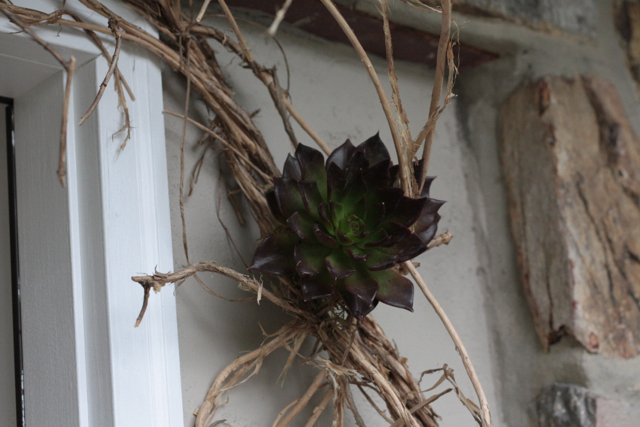 Baby Grace and I also planted two big iron baskets full of flowers and these hang flush against the stone wall on either side of the door. Currently these baskets are being hidden by my nandina bushes. I can’t prune these shrubs back yet because I am waiting for the berries the bushes are producing. While I wait for my berries, the hanging baskets will have a chance to grow and flourish. I love the way this project turned out, if I thought I could have gotten away with it I would have hung a few more succulents on the garland but because I am trying to make this work with the 5 nails that are holding up the garland, (and because I didn’t want it to fall down and hear my husband say I told you so) I thought I better not put anymore pressure or weight on my design. Instead I planted hyacinth bean seeds and when the vine grows I will train it up and around the front door. This is a living door and I am very excited to watch it grow. The idea to create this design came from seeing so many living walls or rooftops in Europe. This project is also a part of my new commitment to my home and to design. 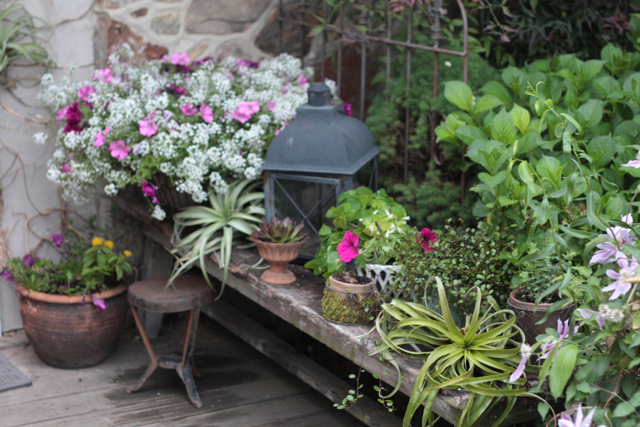 Having all of these lovely flowers, props, and containers on my property and never finding time to design with them is simply sinful, and I am going to change that. I am going to work on this place and get it ready for something very special. I have a new plan!!! Oh please come and do MY door! !